The Caprimulgiformes (nighthawks and nightjars) is an order of birds with global distribution, excluding Antarctica. Most are nocturnal insectivores. The order gets its name from the Latin “goat sucker,” an old name based on a myth that a European species entered barns at night and suckled lactating goats at night until they were dry. Most Caprimulgiform birds do not build a nest, but lay their egg or eggs directly onto the ground, tree branch, or flat top roof. Both parents participate in incubation. For camouflage, the semi-altricial, down-covered chicks remain immobile. The Common Nighthawk (Chordeiles minor) is a crepuscular to nocturnal bird with cryptic coloration and intricate patterns. During the day, it is difficult to spot when at rest; it has a horizontal stance on short legs and perches parallel to tree branches, the ground, or a roof. 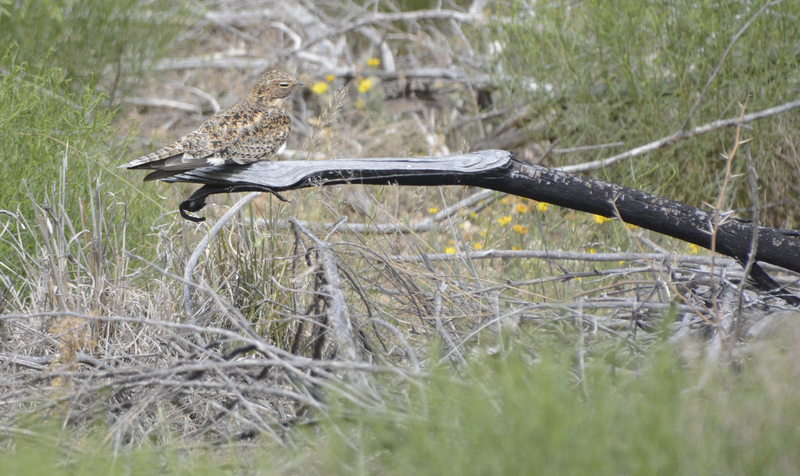 But once airborne, the common nighthawk exhibits a buoyant, but erratic flight. It lacks facial rictal bristles and has a small beak which belies the gape of a very large mouth. The common nighthawk also has long, slender wings with distinctive white wing-patches that at rest extend beyond the tail. The common nighthawk is sometimes called a “bull-bat” due to its perceived “bat-like” flight, and the “bull-like” booming sound made by its wings as it pulls up from a dive.